The confusing thing about our 20's is that the first time in our lives there aren't set age norms and expectations to rate our success on. I have friends that own houses, friends renting and friends still living at home with their parents. I've got friends working three jobs, friends who own their own businesses and friends that have never worked a day in their lives. Friends that have graduated university now working their dream jobs and friends still deciding what they're going to do as a career. I have friends that are travelling the world and some that have never even left the country. I have 6 friends that are parents, 8 friends that are engaged, 7 friends that are married and 2 that are divorced, yet I've still got friends that have never been in a relationship. That's okay too! A few of my friends have either taken their own lives or had their lives taken by others or by horrific accidents/illnesses, yet some friends have never felt grief strangle their hearts. See, the thing about your 20's is that there is no right or wrong, no better or worse and most importantly, no-one is better than anyone else. Life isn't a race - we are each on our own path. So, the next time you judge another or compare yourself to someone else, please remember they're doing their best for their own journey, and so are you. Dear Hayden, I'm writing this letter by hand because technology is about to take over. Your phone will do everything, emails will try to rule your life, and I need to tell you not to fall for it. Creativity will make you stand out - when others send an email you must remember that less is more. Send cards, write letters, and know that FRIENDS are people that you're actually friends with. This doesn't make sense to you right now, but it will. Enjoy this time before mobile phone madness hits. Celebrate everything - you will have much to celebrate but feel there is no time. You will have the chance to do incredible things but just do them. Don't worry about not following the crowd, don't worry about feeling that you don't care about the things other people do seem to, just know what you do care about and know that makes you happy. Your life will have chapters, enjoy every one of them and make the most of all of it. Don't spend time with people you don't like, don't spend time on things you don't care about, your focus is actually a great thing. You will have great friends, you will be offered amazing opportunities and you will live your best life, always. You are a free spirit, some people won't like that or find it easy, and that is not your problem. As some of you will know from seeing my Instagram Stories, I’ve been doing a lot of running recently. It began when I was having dinner with my parents and we joked about my Dad & I running the London Marathon together this coming April. Since then I have joined a gym, had a few Personal Training sessions, started running, and kept up frequent exercise when I am away from home by doing workouts in my hotel rooms! This leads me on to do my first ever 10K race for charity this November in Cardiff, which will all be in good practice for the marathon in April. A year ago I could not have even imagined doing a 5K, let alone a 10K so I'm feeling really happy and excited that I've got to this stage (and also slightly terrified, the Paranoia is definitely starting to set in!) I'm running 4 times a week at the moment. Each week the long runs get longer, and the short ones also get longer (damn them!!) which has given me plenty of thinking time. 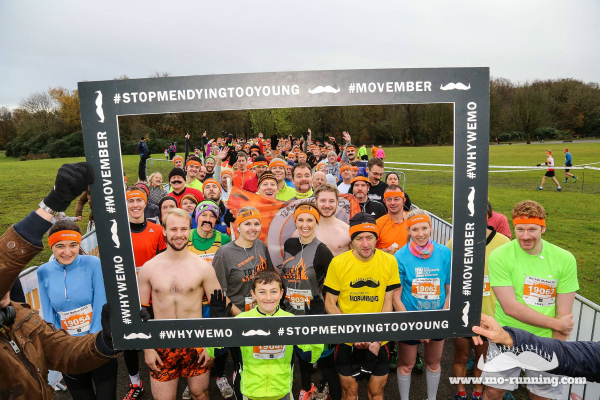 As I mentioned, I've found exercising incredibly beneficial to my mental health, which is mostly the reason I've decided to run for the charity Movember which raises awareness of Depression amongst young Men in the UK and is dedicated to preventing male suicide, the single biggest killer of men under the age of 45 in the UK. (I will be running the London Marathon 2018 in aid of MIND Charity). Having experienced Depression and Anxiety over the past year or so, (and most of the time hiding it - I was able to work, appear happy, carry on as normal) it's so good to see that the stigma and silence surrounding mental health is starting to shift and more and more people are starting to talk about it openly and not feel any shame in doing so. I can count several male friends of mine who have contemplated or attempted suicide. In some cases, no one was aware that these people were depressed or suffering, let alone feeling suicidal, which is why it is so important for us all to learn to be open about our feelings and mental health and also to listen to and look out for the mental health of others. Prince William said in a speech for the 'Heads Together' campaign "The suicide rate among young men in this country is an appalling stain on our society. Suicide is the biggest killer of men under 40 in this country. Not cancer, not knife crime, not road deaths - suicide. If one of these other issues took so many young lives, there would be a national outcry." More and more Male Bloggers are also talking about their own experiences which can be a huge comfort to read for those experiencing similar things, and personally, I've found the male blogging community (and blogging community in general) on social media a hugely supportive bunch of kind people who can learn from each other's experiences. With World Suicide Prevention Day just passed and World Mental Health Awareness Day coming up on the 10th of October, I see this as a perfect time to raise awareness for such issues. If you are reading this and are currently experiencing any form of mental illness, I hope it reassures you to know that you are not alone. It’s completely normal, there is help available to you, and no matter how low you feel, you won’t feel this way forever. I’ve listed some help and some further reading below, and if you would like to sponsor me to help raise money for the Movember Charity you can visit my Fundraising Page here.